Some of the best boating days can be in the early spring or late fall. The water is calm and the sun is out, but the air is still a little chilly. It’s on these days you wished your boat had a heater. Well, wish no longer, because we’re going to tackle installing an aftermarket heater on a mid-sized runabout. More specifically, the boat is a 2004 Air Nautique SV211 Team Edition. Wakeboarders and water-skiers will often push the season boundaries, riding as long as there is no ice. 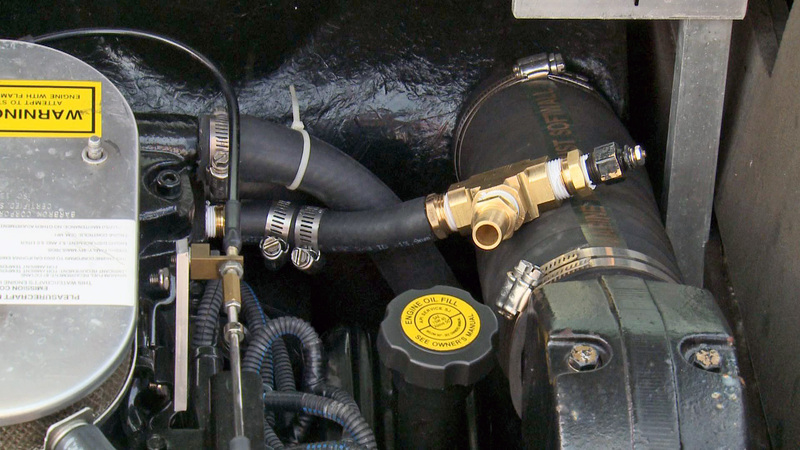 While the drive system may be different on these boats, the engines are still the same. What I’m getting at is you can install a heater into any inboard or I/O. The unit being installed is the Heater Craft 300 Sport Series. 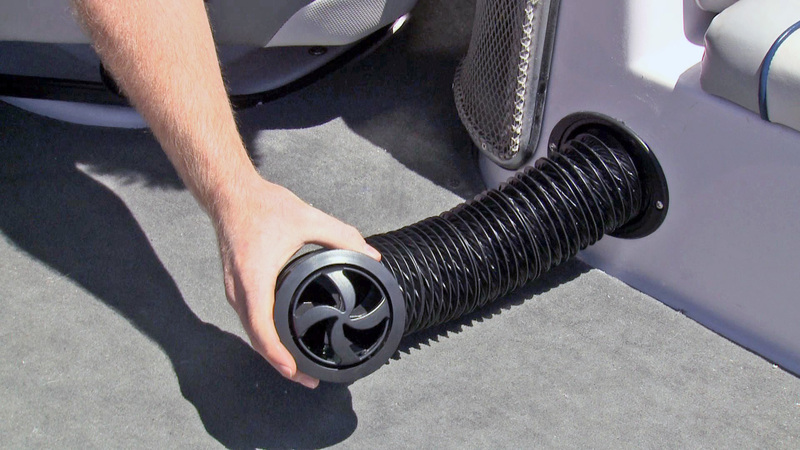 This three-vent system has two retractable hot tubes and one fixed tube, so it will provide more than ample coverage for the 21-foot boat. A heating system may sound complicated, but it’s really rather simple. It draws off the raw water system of your engine to heat the core and uses a fan to circulate the air. 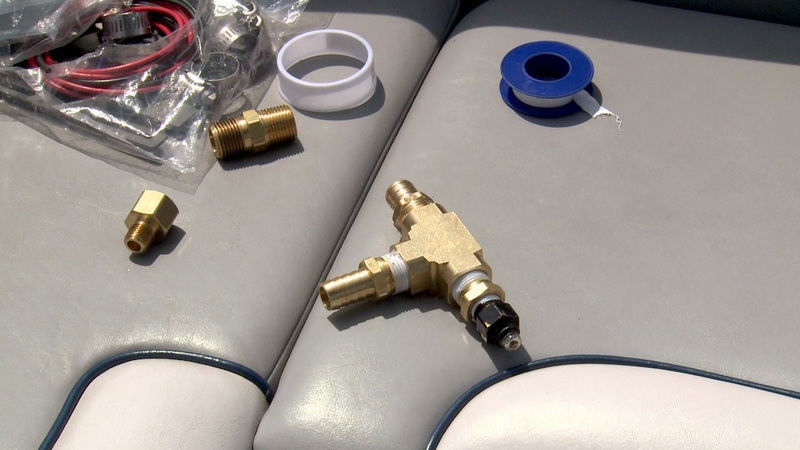 Heater Craft puts it all into one handy, easy-to-install unit. Powering the Nautique 211 is the PCM Excalibur 330 V8. My first step was to check the owner’s manual on the engine and, sure enough, I found a water flow diagram that showed exactly where to draw from and return to for just such an install. As the diagram recommended, I used the temperature sending unit at the top of the block as my outflow point. First, I removed the sending unit wire, which gave me access to remove the fitting. Since this piece was still needed, I had to create a “T” in order to have the hose runoff. Using the provided fittings and Teflon tape, I was able to do so pretty quickly. 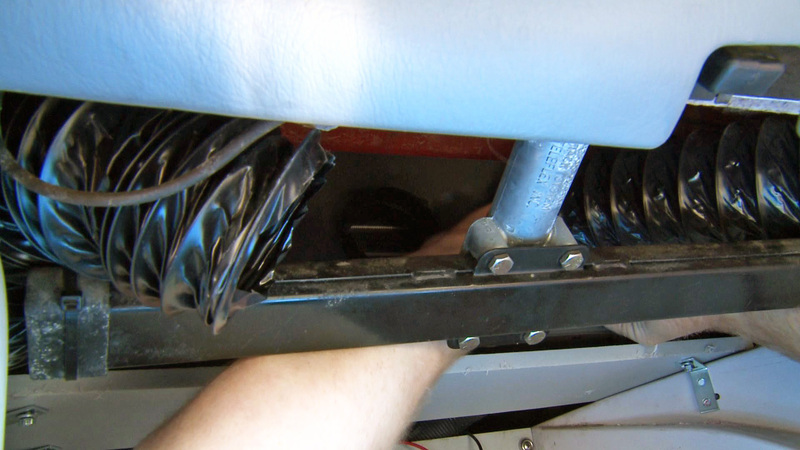 My plan was to get the engine work done first, so I could then run the hoses up to where the unit would be installed. With the T splice complete, I then looked to tackle tapping into the water pump as the return source. Once again, having the diagram available made it quite easy – except for one small detail. 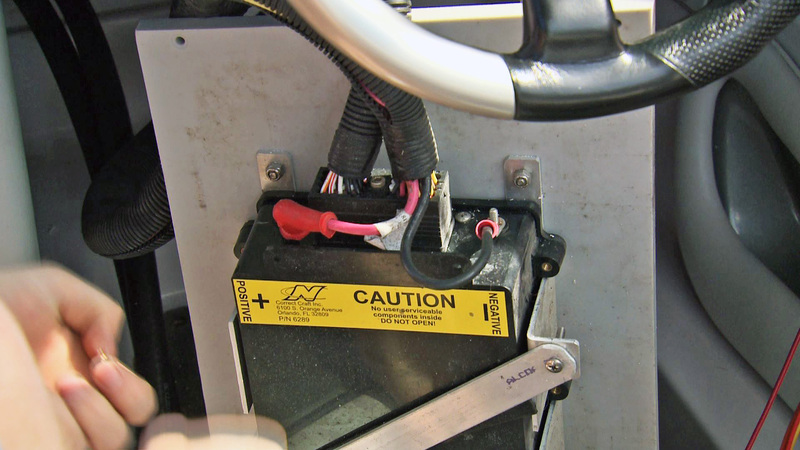 The SV211 is a V-drive, so the diagram was backwards (the water pump is at the back of the boat). It was a lesson in flexibility, dexterity and patience to remove the bolt from the water pump and attach the barbed fitting for the hose. But with that finally complete I was able to use a fish to feed the hoses up to the helm, where I would be mounting the heater unit. Don’t worry if you lose track of which hose is which, because it doesn’t matter. Another bonus of how easy this unit is to install. Wiring for the unit is also well explained in the instructions. It comes with a three-speed switch and three wires (one representing each speed). There is also your ground and positive wires. 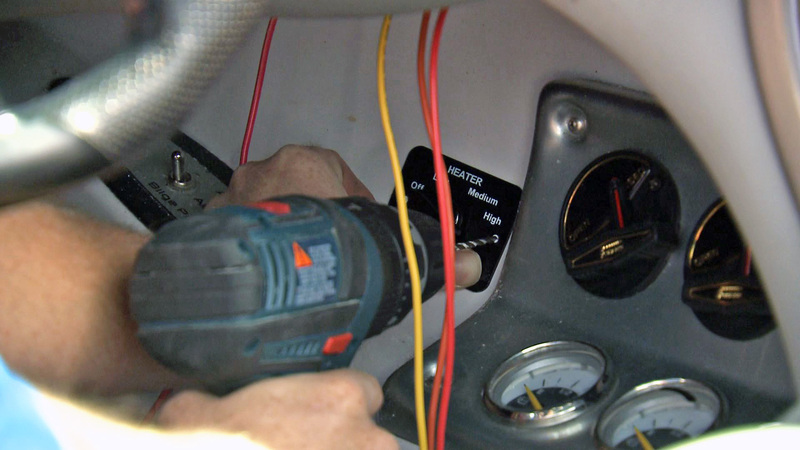 The Nautique’s circuit breaker board was located under the helm, so I just used the positive and ground leads coming off of that and wired up the switch accordingly. 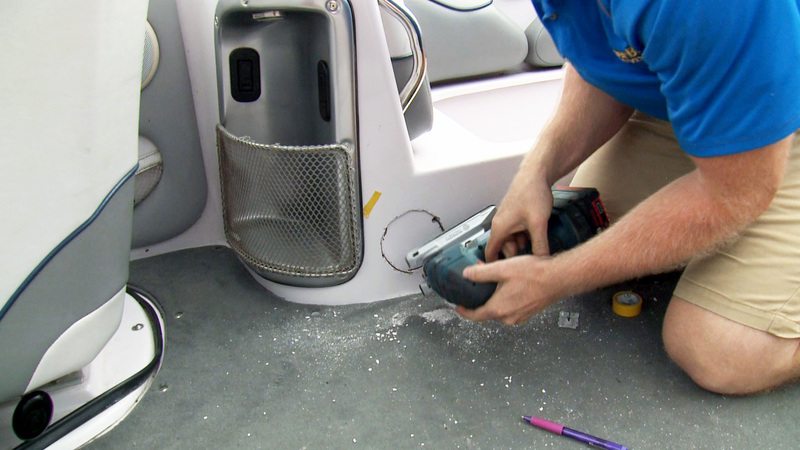 Then came the part that everyone hates… cutting holes in the boat. I had to drill a small hole for the switch, as well as cut two three-inch holes for the two euro vents. I chose to mount them in front of and behind the helm so they could service the entire boat. With the holes cut with a jig saw, it was simply just a matter of running the tubes and securing them in place. Using a piece of King Starboard, I was able to mount the heater under the helm. Difficulty wise, I would give this project a 6 out of 10. 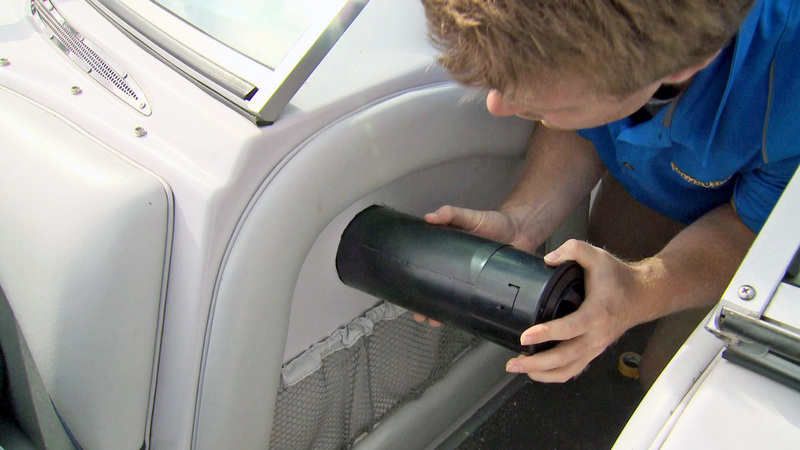 If you have decent mechanical knowledge and you don’t mind cutting a few holes in your boat, installing a heater is easily in your wheelhouse – and it’s something you’ll thank yourself for tackling when the temperature drops. This project is featured in the Fall 2013 issue of Boats&Places and on episode 4 of the 2014 Season of PowerBoat Television.